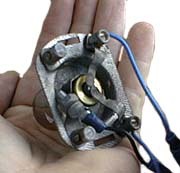 The lights on most 6V Vespas are pretty sad and are directly run off the flywheel magneto so they vary their brightness with the engine RPMs. On this bike I wanted to set up a brighter light in the existing headlight reflector and also have it run directly off the battery like a car. This turned out not to be possible due to the rectifier (see electrical page) In the past when I have used a 12V engine in a 6V frame I use a P200E indicator bulb in the existing 6V headsets because the bulb fits conveniently into the holder. 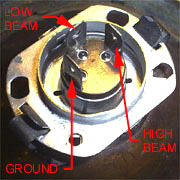 This setup will only work on the low beam setting as the high beam will blow immediately. 1. Take the existing bulb holder and remove the electrical stub connectors by either drilling them out or removing the rivets by squashing the ends with pliers. Once this part is finished it will be flipped and used as a large retaining clip for the new bulb. Below is a shot of an original bulb holder. 2. 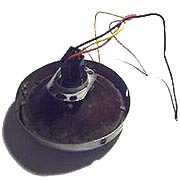 Take the bulb holder assembly and remove the old bulb holder part from the center with a grinder or some small tin snips. 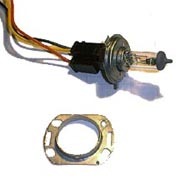 It should look like below or at least have enough metal removed to allow the connections of the new bulb to stick through the center. 3. The new bulb is an H4 type halogen that costs about $8.00 at most auto shops and has an outside diameter that is a hair larger than the inside of the reflector hole. You'll need to slightly enlarge the existing hole with pliers until the bulb is a tight fit. Also keep the notch at the top as the new bulb has a locator pin at the top. Bear in mind that if the wiring harness has not been changed in your bike you'll have to select a voltage/wattage that is consistent with your bike. 4. Then use the large retaining clip made from the old headlight bulb holder to lock the new bulb in place. 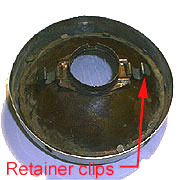 There are two flexible retaining clips on either side of the headlight reflector to hold it in place. 5. Finally add a new connector for the bulb (it is a national standard) onto the old wiring harness. See below for wire connections to the existing loom.